The 13,625-acre Laurel Ridge State Park stretches along Laurel Mountain from the picturesque Youghiogheny River at Ohiopyle, to the Conemaugh Gorge near Johnstown. This large park spans Cambria, Fayette, Somerset, and Westmoreland counties. 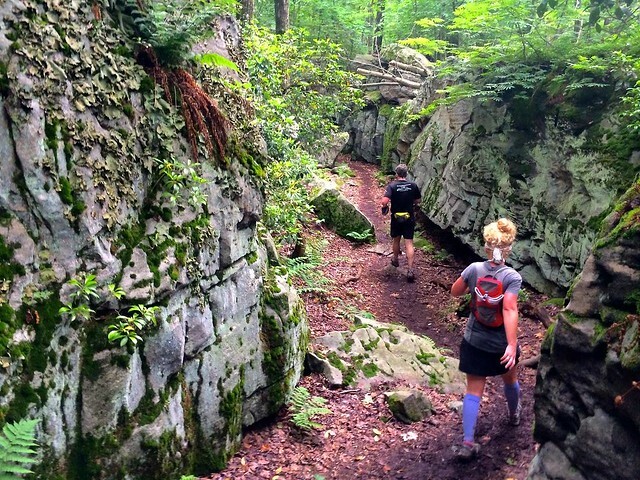 The main feature of the park is the 70-mile Laurel Highlands Hiking Trail, which provides the setting for a semi-wilderness backpacking and day hiking experience. One of the most exciting reasons to visit the park is for its scenery. Spring wildflowers dot the forest floor in early April followed by a vibrant green forest as leaf-out begins in late April. Mountain laurel blooms in June and rhododendron blooms in late June and early July. Come to the park in mid-October and witness fall color in all its glory. Winter is spectacular when the park is covered in a deep blanket of snow and the occasional great horned owl calls through the moon-lit forest. Contact the Laurel Hill State Park office for facility seasons and hours. Laurel Ridge State Park is in Cambria, Fayette, Westmoreland, and Somerset counties, Pennsylvania. Responding emergency personnel and equipment may be at your expense. Hospital directions are posted at the pavilion and at the warming hut at the PA 653 ski area. GPS coordinates are posted on bulletin board at each trailhead.